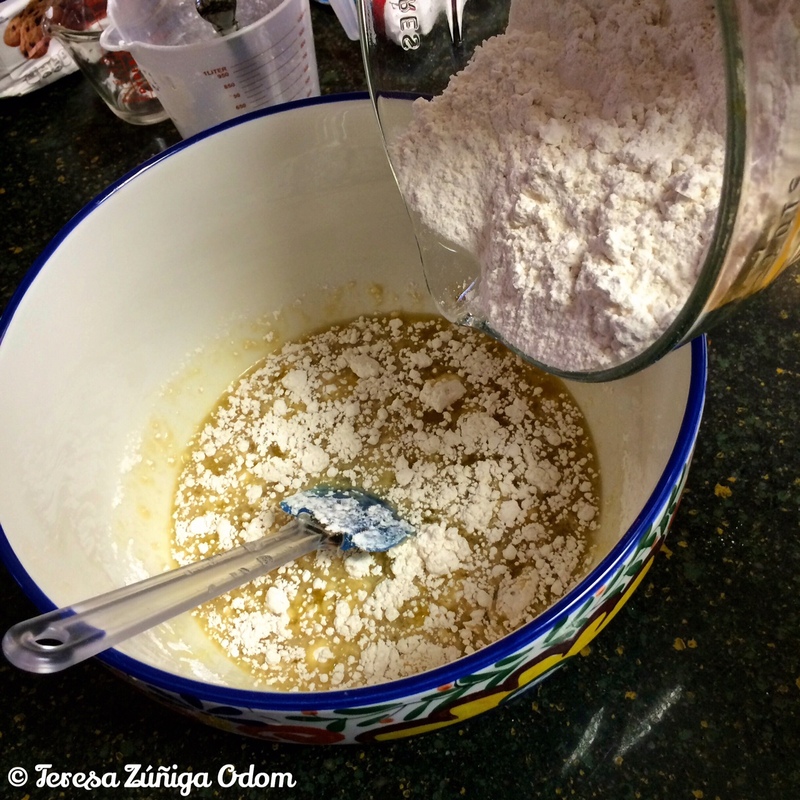 Mexican Wedding Cookies – My Favorite Christmas Cookie! Every year I have my annual Christmas cookie swap party. Everyone brings 12 dozen (yes! you read that right!) of their one favorite cookie and you leave with 12 dozen different cookies. I have the party the first week of December so that everyone can enjoy and share the cookies during the month of December for family gatherings, to use as gifts, or just eat them all themselves! The cookies I make every year without fail? The Mexican Wedding cookie! It is my all time favorite cookie and it was my dad’s favorite cookie as well. I remember my mother always making these cookies for him and how much he loved them. 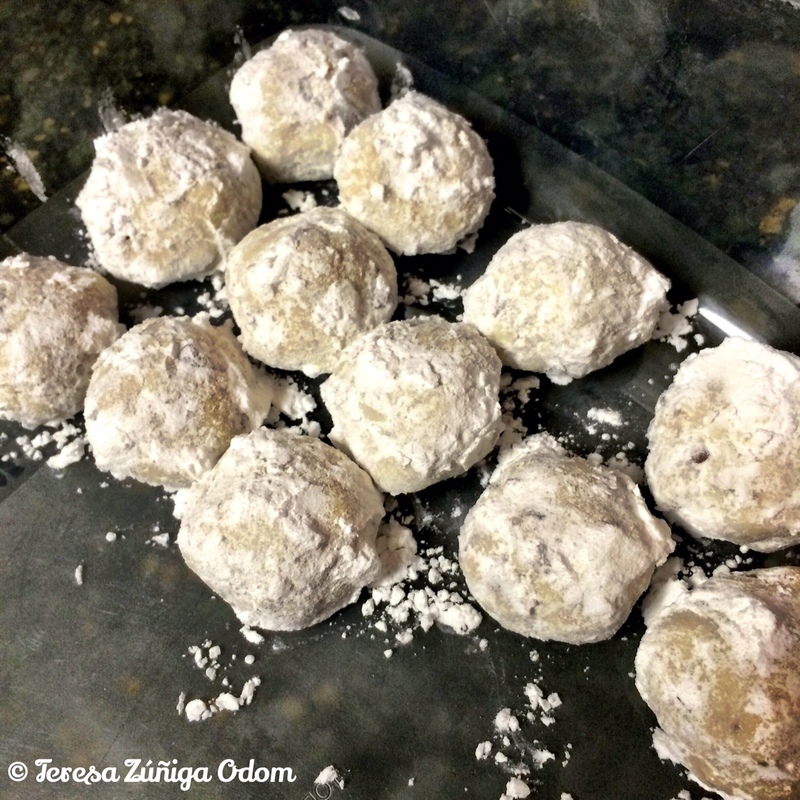 He had a sweet tooth for certain things and Mexican Wedding cookies was one of those things! My mother passed her recipe down to me and I am proud to say I can make them almost as well as she does. This year I decided to document the process in photos. 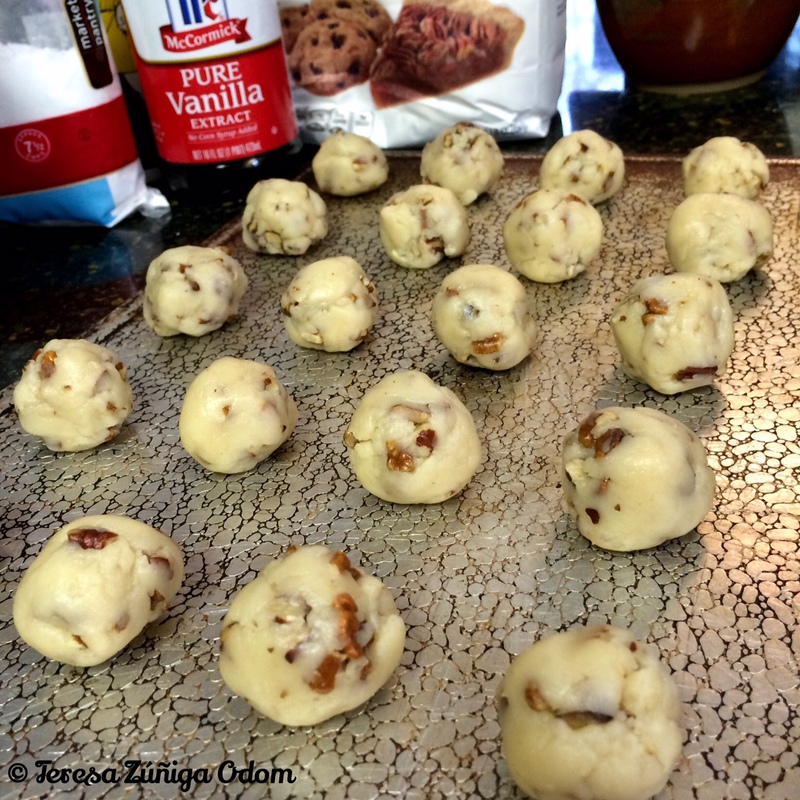 They are an easy cookie to make and oh so good! But as I was making them, I was curious about their origin. I mean, where did they get their name and why were they also called Russian Tea Cakes? So I did a little research online and found a great history from Chef Miguel Ravago, co-founder of Fonda San Miguel in Austin, Texas. I noticed his mother’s recipe, that he shares in the cookbook – Baking From the Heart – includes cinnamon. My mother’s does not, but it got me interested in trying this at some point. 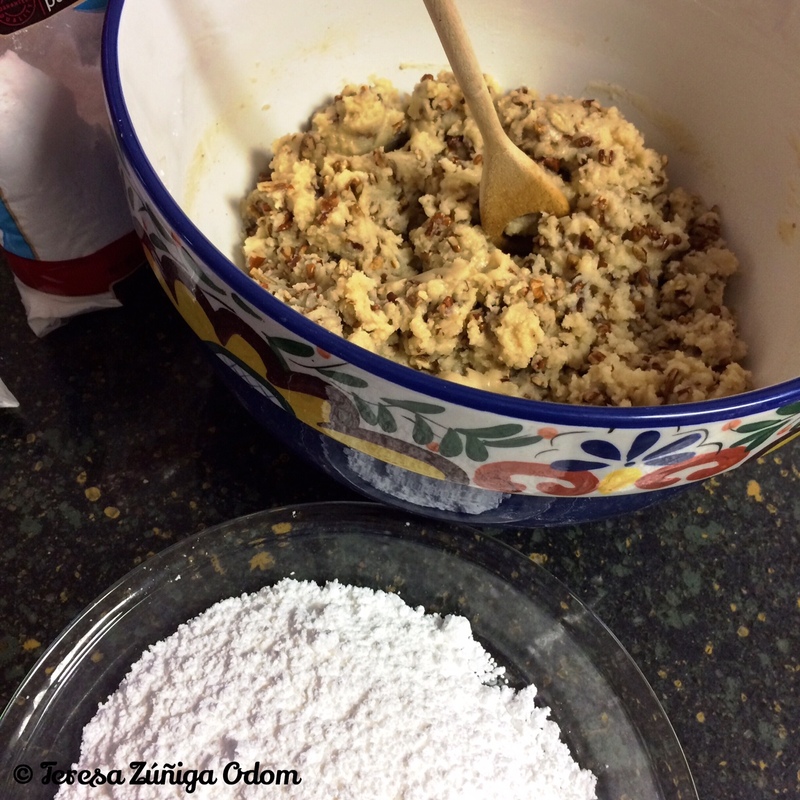 It reminded me of another favorite Mexican cookie – bizcochitos that I also love and can’t get enough of when I visit my family in New Mexico! My cousin Nelinda makes a bizcochito to DIE for! Chef Ravago says the origin of this cookie is Arabic and was taken to Mexico by the Spaniards. They are called Polvorones de Canela – polvorones meaning “dust” because the cookies are covered in powdered sugar and canela – meaning cinnamon. He recalled how his mother would always have these cookies baked every week to have after church to enjoy along with a Mexican chocolate drink. But polvorones are also part of most Mexican weddings – they are gathered into a pyramid at the receptions making a gorgeous white centerpiece and stacked very high so everyone can reach them. At weddings these cookies are best enjoyed with a glass of anise liqueur – according to Ravago’s grandfather. 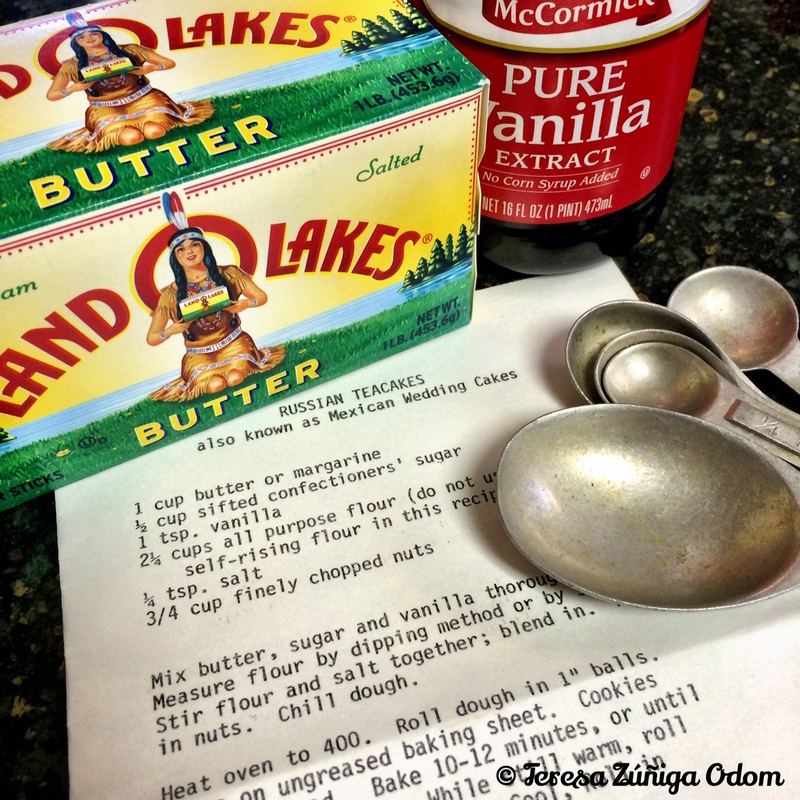 Here is my mother’s recipe: 1 cup butter or margarine; 1/2 cup sifted confectioners sugar; 1 tsp. vanilla; 2-1/4 cups of all-purpose flour (do not use self-riding flour); 1/4 tsp. salt, and 3/4 cups finely chopped nuts (I use pecans). 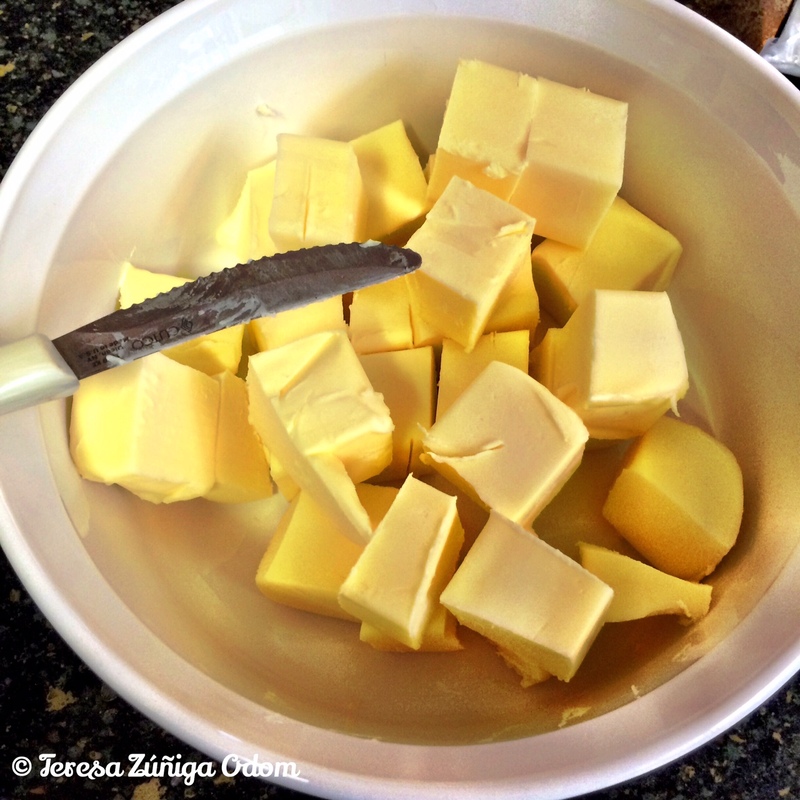 Mix butter, sugar and vanilla thoroughly. 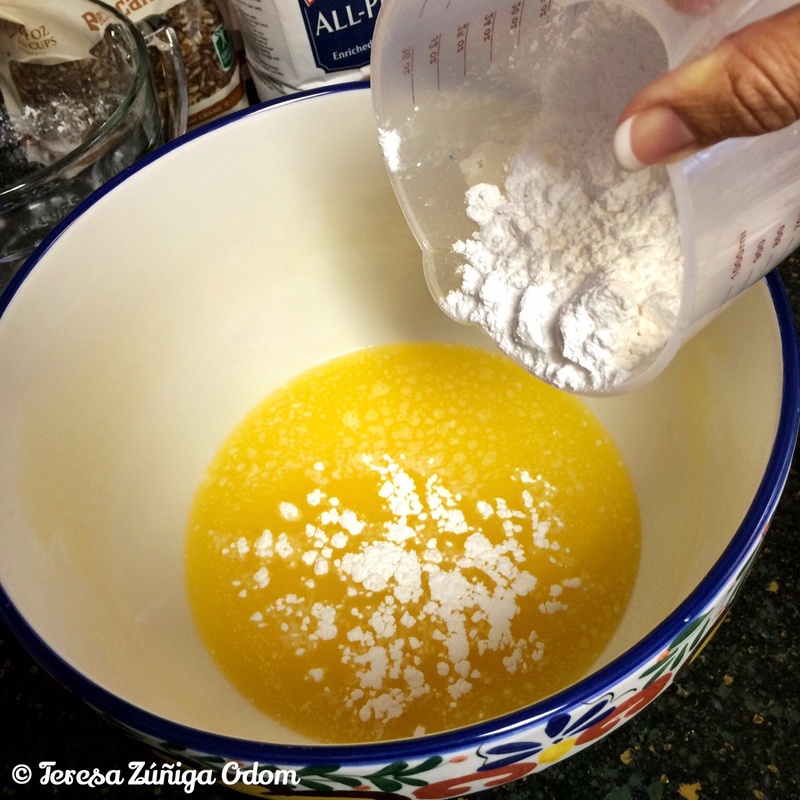 Measure flour by dipping method or by sifting. Stir flour and salt together; blend in. 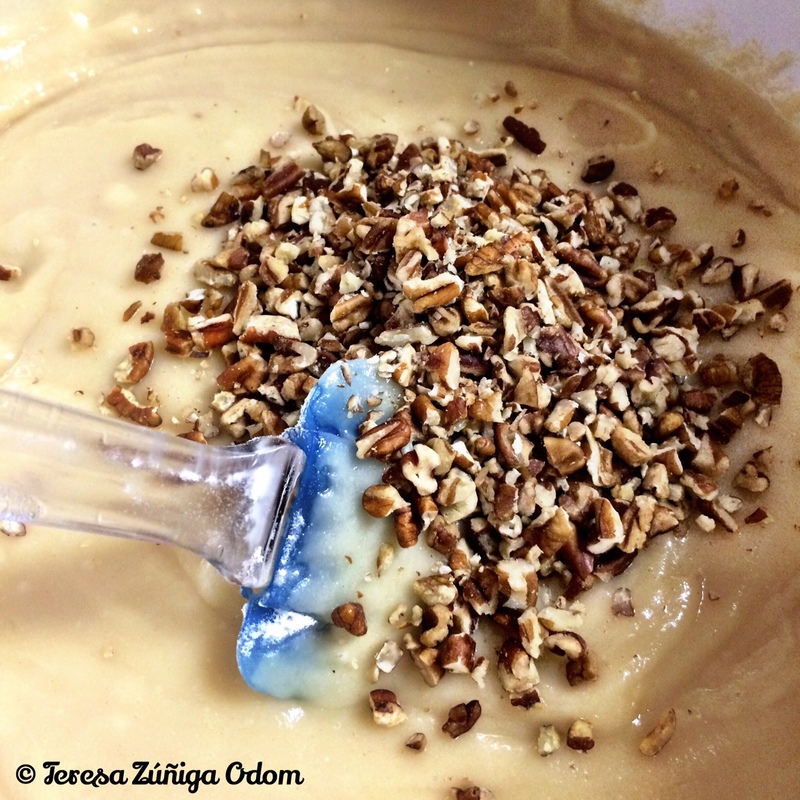 mix in nuts. Chill dough. You then heat the oven to 400 degrees. Roll dough in 1 inch balls. Place on ungreased baking sheet. Cookies do not spread. Bake 10-12 minutes, or until set but not brown. While still warm, roll in confectioners sugar. Cool. Roll in sugar again. 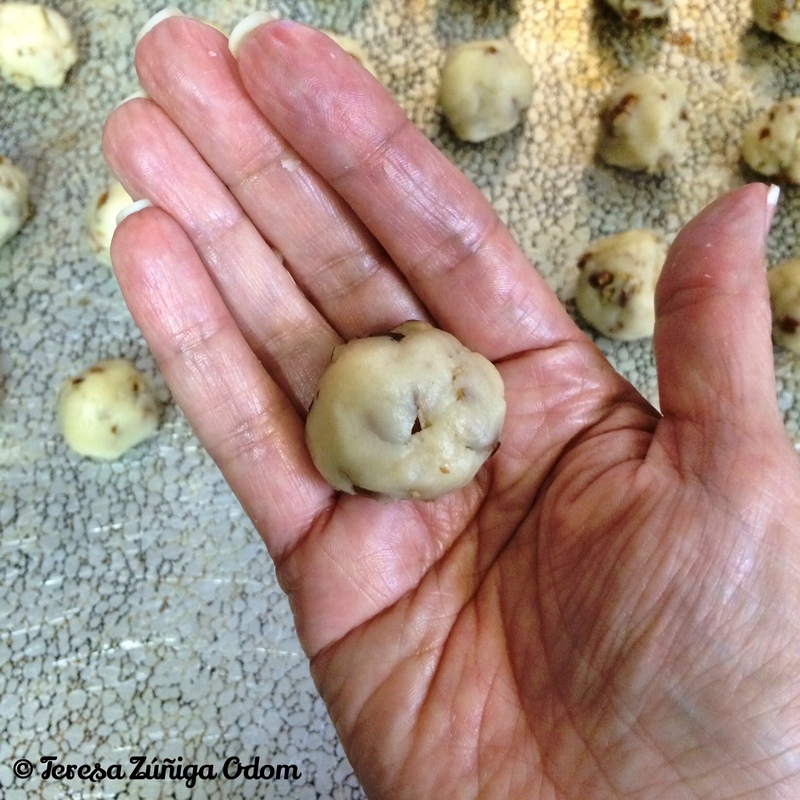 This recipe makes about 4 dozen 1 inch cookies. I still don’t know why these are called Russian Tea Cakes…but they will always be Mexican cookies to me. I doubled my recipe so this is really 2 cups of butter! Next comes the vanilla…I love the smell of vanilla, don’t you? 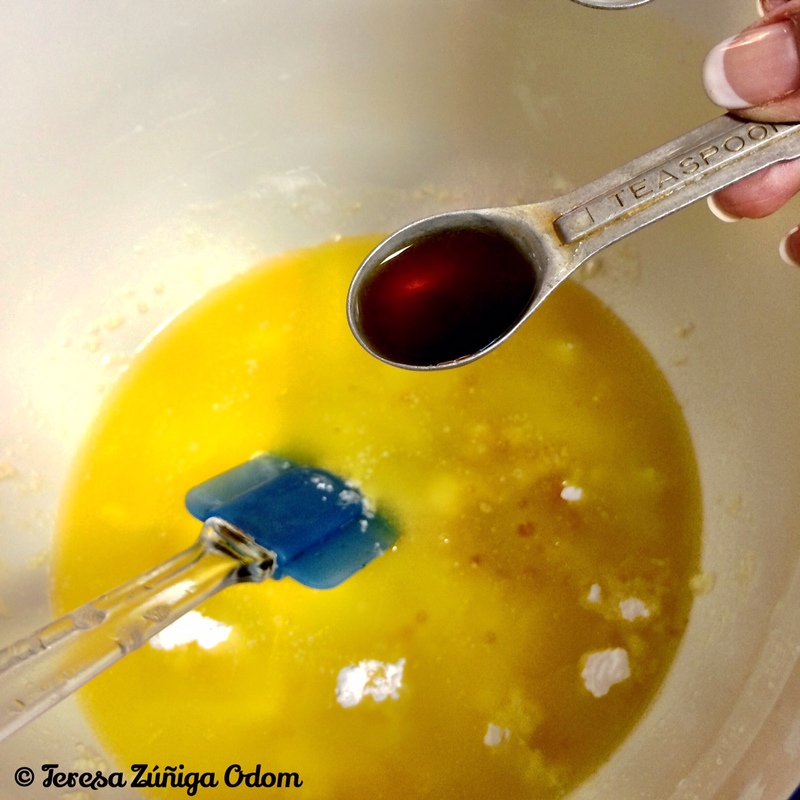 Adding the all purpose flour to the butter, sugar and vanilla mixture. 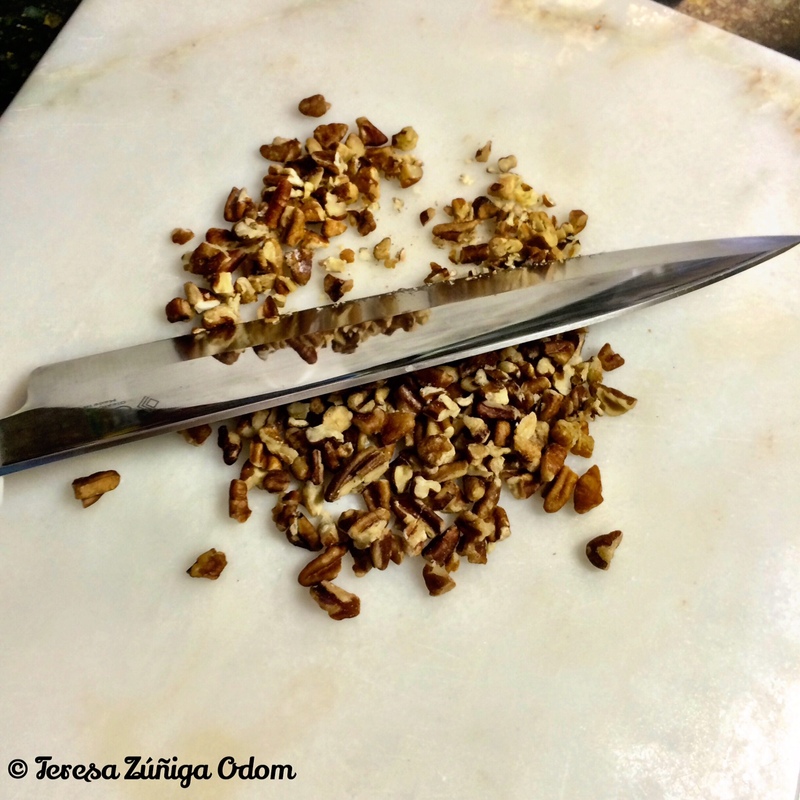 Chopping up the pecans into smaller bits to add to the mixture. 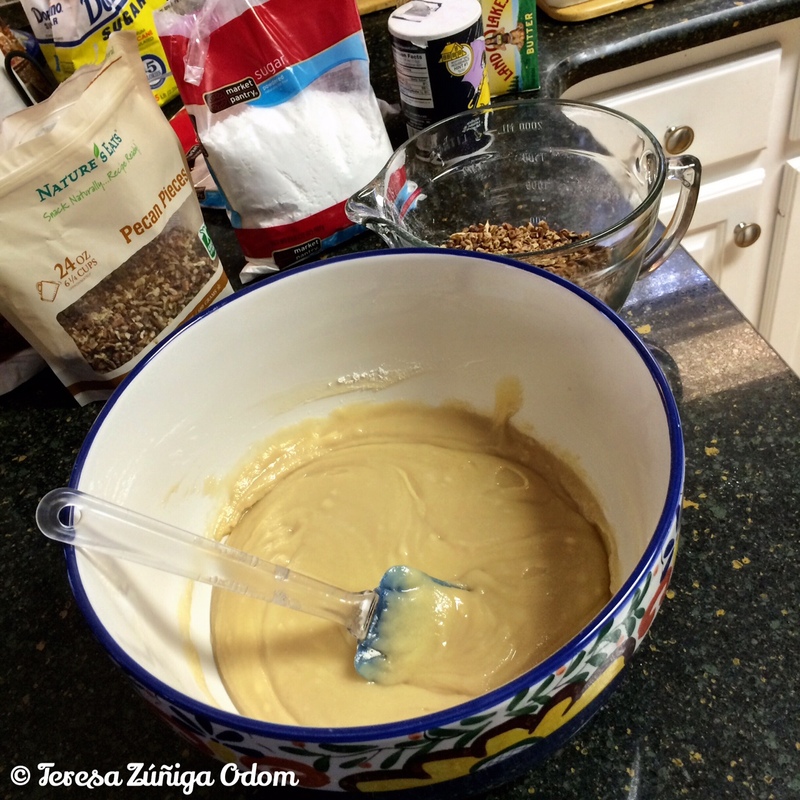 Mixture is ready and the confectioner sugar is on standby for the rolling to begin! 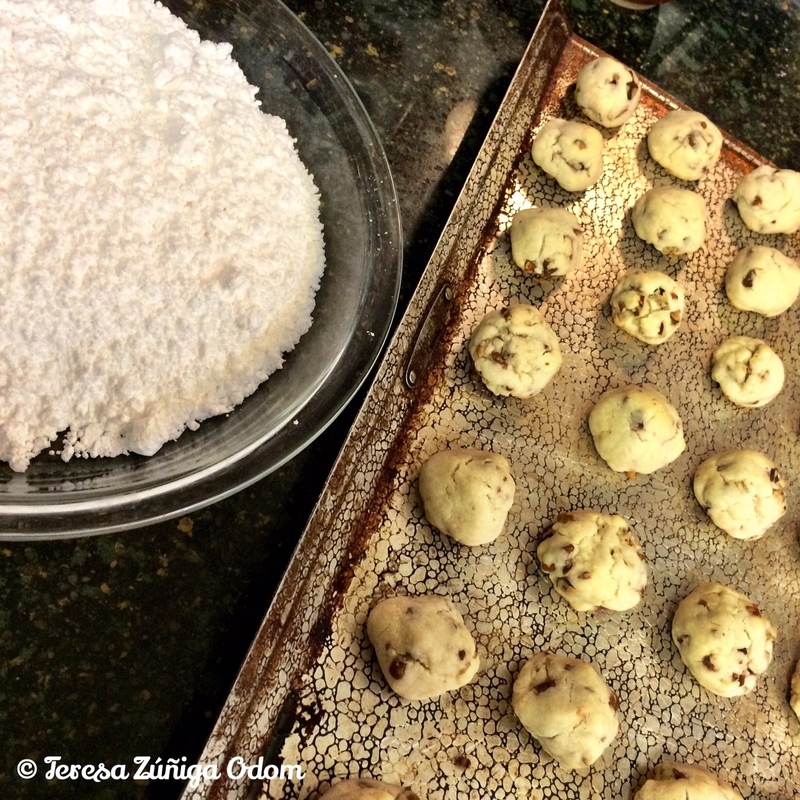 Rolling the mixture into one inch balls to bake for 10-12 minutes at 400 degrees. 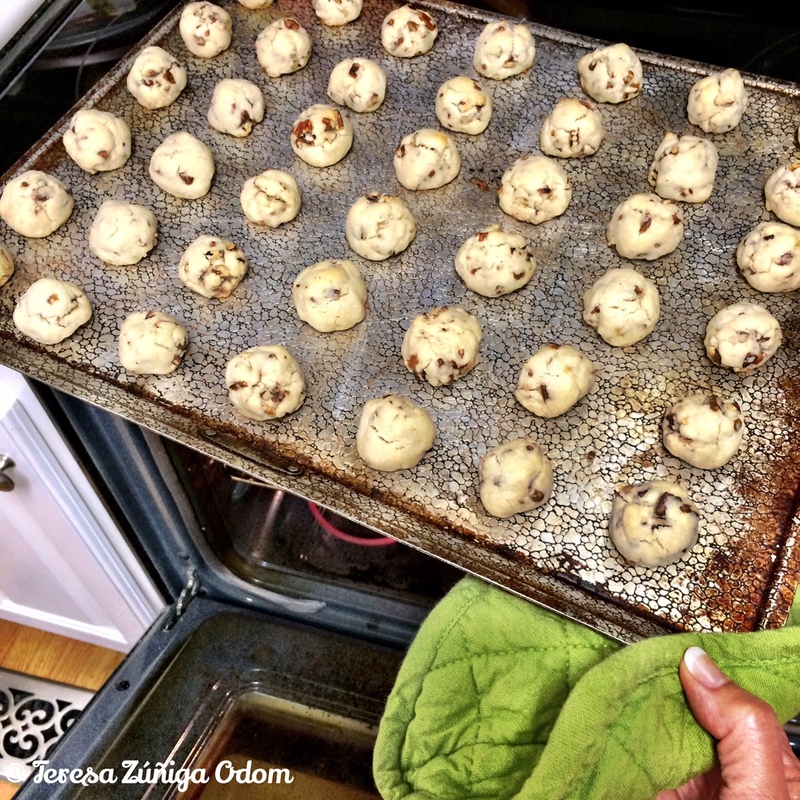 They definitely don’t change much after baking…but they definitely smell terrific! 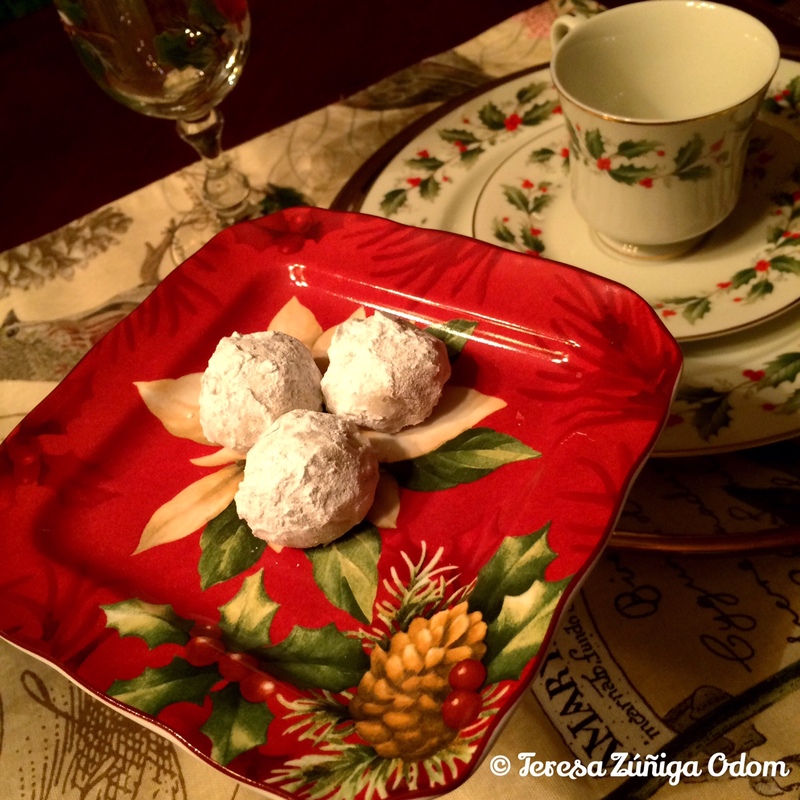 The confectioners sugar clings to these warm little nuggets! The finished product! Actually, after they cooled a bit, I rolled them again for added sugar high! 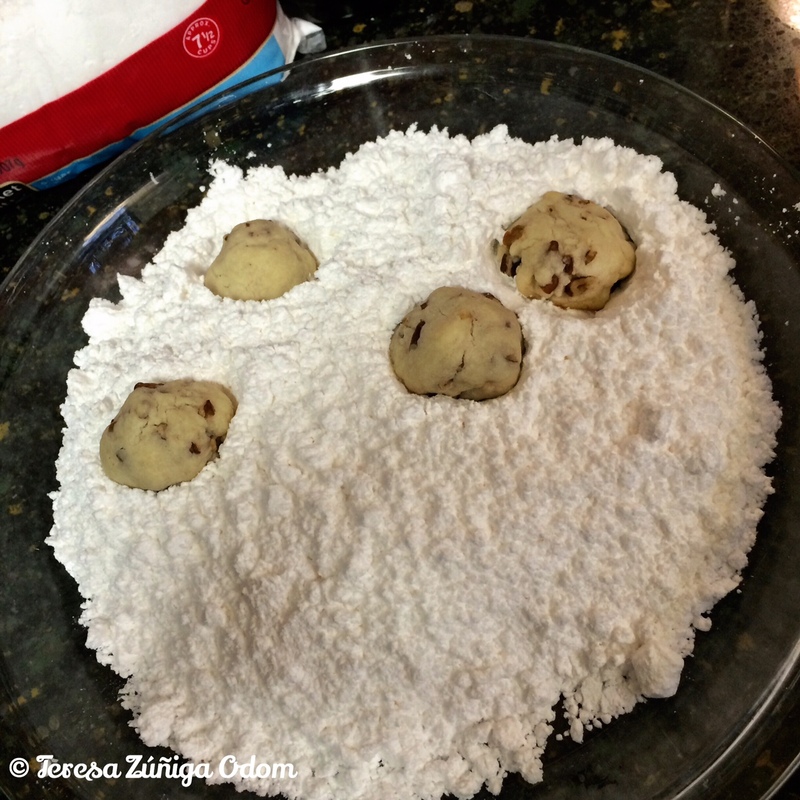 This entry was posted in Christmas, Cooking, Cousins, Familia, Food, Holidays, Mexican and tagged Chef Miguel Ravago, Cookies, History, Mexican Wedding Cookies, polvorones, Recipe on December 23, 2014 by Southern Señora.